Francis Maes's comprehensive and imaginative book introduces the general public to the scholarly debate that has revolutionized Russian music history over the past two decades. Based on the most recent critical literature, A History of Russian Music summarizes the new view of Russian music and provides a solid overview of the relationships between artistic movements and political ideas. The revision of Russian music history may count as one of the most significant achievements of recent musicology. The Western view used to be largely based on the ideas of Vladimir Stasov, a friend and confidant of leading nineteenth-century Russian composers who was more a propagandist than a historian. With the deconstruction of Stasov's interpretation, stereotyped views have been replaced by a fuller understanding of the conditions and the context in which composers such as Tchaikovsky, Mussorgsky, and Stravinsky created their oeuvres. Even the more recent history of Soviet music, in particular the achievement of Dmitry Shostakovich, is being assessed on new documentary grounds. A more complex conception of Russian music develops as Maes explores the cultural and historical milieu from which great works have emerged. Questioning and re-examining traditional views, the author considers the personal development of composers, the relationship of art to social and political ideals in Russia, and the ideologies behind musical research. Francis Maes is Artistic Director of the Flanders Festival and the editor of The Empire Resounds: Music in the Days of Charles V (1999). 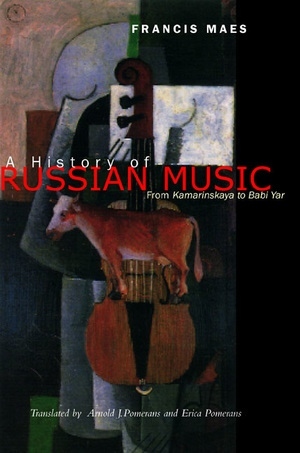 "At last there is a short and comprehensive introduction to Russian music and its history that is up to date in research, sophisticated in viewpoint, elegantly written, and completely free of nonsense. It fills a longstanding gap and fills it most satisfyingly. Francis Maes deserves hearty congratulations and thanks. "—Richard Taruskin, author of Stravinsky and the Russian Traditions: A Biography of the Works Through "Mavra"
13. "Prokofiev Must Return to Us"